Have you heard of the living minimally trend? People are casting off oversized houses, overstuffed closets, and cluttered basements for a lighter, unencumbered lifestyle. Nothing’s sacred—even your bulky sedan or SUV. 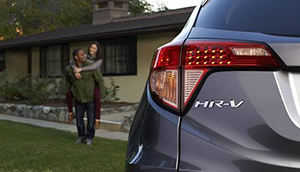 The all-new 2016 Honda HR-V condenses everything you need in a vehicle while still maximizing space. A fuel efficient 1.8L inline-four sourced from the Civic provides lively acceleration in the city and out on the highway, up to 665 cu. ft. of cargo space (with all the seats up) rivals much larger crossovers, and a crisp, coupe-like look with standard 17-inch wheels will have you looking forward to spending the afternoon shining up the paint with that yearly wax. The 2016 Honda HR-V is set to arrive at Jason Armstrong’s Huntsville Honda this summer, and we can guarantee that it will be a huge seller. To factory pre-order your own Honda HR-V in time for its debut, contact our Muskoka area dealership sales team. Small doesn’t mean spartan in the 2016 Honda HR-V. In fact, you’ll be at want for nothing once you start to check over all its standard features: Bluetooth HandsFreeLink for streaming music and phone pairing, Multi-angle rearview camera, hill start assist, and air conditioning. But the greatest advantage in the new HR-V over the rest of the compact crossover SUVs following Honda’s lead is its configurable rear Magic Seats. Not only can they fold down flat for long objects, but they can also flip up and back to allow for tall items like plants and furniture. Based on an extended Fit platform at the new manufacturing plant in Celaya, Mexico, the 2016 Honda HR-V is lightweight and nimble just like its Honda hatchback cousin. But if you want the extra winter traction and stability provided by all-wheel drive, you can specify your 2016 HR-V with the latest version of Honda’s Real Time AWD with Intelligent Control System. How it works is that when accelerating out of corners or when slippage is detected at the front wheels, engine power is instantly directed to the rear. And underneath the hood you’ll find a familiar engine that’s proven its worth in hundreds of thousands of Civic models across the world. This 1.8L SOHC produces 140 horsepower, 127 lb-ft of torque, and an ultra-efficient combined gas mileage of 7.6L/100km. Perched atop the 2016 Honda HR-V’s elevated seat, you’re afforded a clearer view down the road than most compact vehicles. This allows you the chance to spot lane closures and other obstacles so you can adjust your road position before you end up in a long line hoping to shuffle over. If you’d like to load up your 2016 HR-V with Honda’s latest batch of accident prevention gizmos, you’ll want to order the higher level EX or EX-L trim: integrated turn signals give other drivers added notice that you’re changing lanes, LaneWatch alerts you if a vehicle is hiding in your blind spot, and the Expanded View Drivers Mirror features a greater field of vision for cars behind you than a conventional mirror. The Muskoka area, including Orillia, North Bay, Parry Sound Port Carling, and Haliburton, may be away from the big city, but it doesn’t mean that you have to drive hours to get genuine OEM part for your new Honda HR-V. Whether it’s fitted rubber floor mats, a bike rack, cargo carrier, or new wheels and tires, Jason Armstrong’s Huntsville Honda dealership has what you’re looking for—and close to home. 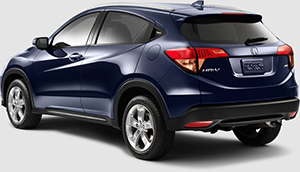 To order Honda HR-V parts and accessories or schedule that next oil change, give us a call today at 855-315-4387.